ADR Services Marketing Book Launch! ADR Services marketing book launch May 24, 2011. Join us in celebrating the launch of our new book! Jim Davis and I have written a book about marketing your Alternative Dispute Resolution Practice. 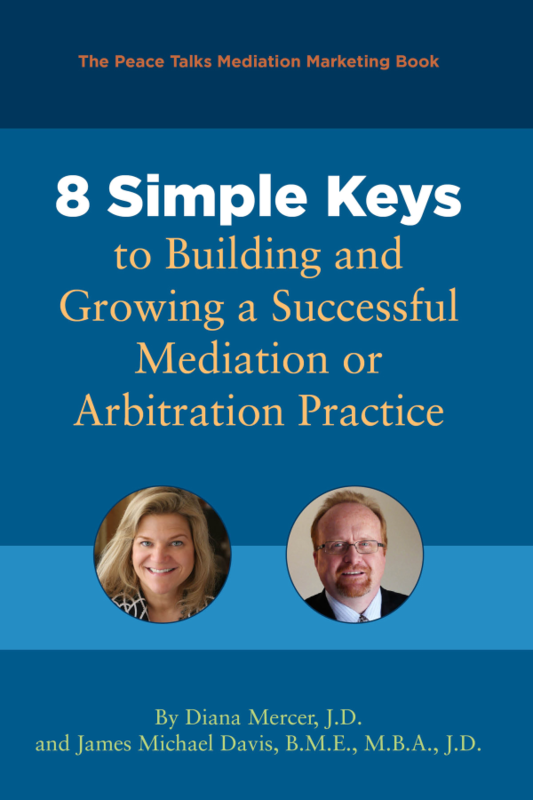 It’s called 8 Simple Keys to Building the Growing a Successful Mediation or Arbitration Practice (The Peace Talks Mediation Marketing Book). It’s full of our tried and true marketing techniques, learned both at business school and through trial and error in our own practices and consulting work. This book is everything we know about what works (and doesn’t work) in marketing your mediation, arbitration or ADR practice. Let’s face it, marketing a service business is challenging. How do you promote yourself without sounding like a jerk, braggart, or worse? How do you get the word out in a professional, sincere, and authentic way? This book is written both for new practitioners as well as seasoned practice owners who wish to learn the latest techniques and social media. It’s also suitable for larger practices who are looking at trimming marketing costs by using more elbow grease and less advertising dollars. The 8 Simple Keys book is available from Peace Talks as well as Amazon.com! This is very exciting as it’s been in the works for almost a year.